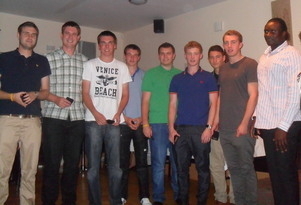 Players, parents, volunteers and friends of Rainford Tennis Club celebrated a season of success at our 2011 End of Season Party took place on Friday at Rainford Labour Club. Over 100 people were in attendance to see trophies presented to all the winners from the 2011 Club Tournament, as well as the Men’s 1st Team being presented with their division winners medals. In addition, Conor Porteus and Maisie Lavelle were both presented with Junior Player of the Year awards for their successes on court in tournaments across the region. The evening, which was thoroughly enjoyed by all those who attended, also raised over £500, which will go towards the Club’s facility development fund.